Get free resources, tools, and printables on the Recycle Rally website. You can also learn how you can bring recycling to your classroom, school, and community like Marni did. Learn more about Recycle Rally today! As a teacher, one of the best things you can do is get involved in your community. I’ve seen some amazing stories of educators who do this, and it’s something I strive to do as well. I’ve been a special education teacher for 13 years, and I love my job. With special education, you spend time showing your students that they matter and that we all learn a little differently. So I was excited to find a program that could start within my classroom—with my students—to teach the entire school about the importance of recycling. Marni shows her students how it’s done! My school has always recycled—we all have recycling bins in our classrooms. Yet, I noticed that students would often throw recyclable materials into the garbage. It occurred to me that if students in my classroom didn’t always recycle the correct way, then other students were probably doing the same thing. This led to my interest in a program called Recycle Rally, which I’d learned about from a neighboring district. I’d heard about how much the program helped educate students about recycling, so I wanted to do the same. I took the idea to my administration, explaining how I thought it was an opportunity to get the whole school and community involved, and they loved it. Of course, it wasn’t just a yes right away. We had to sign up for the Recycle Rally program. We needed to look at logistics, like determining how to gather recyclable materials, figuring out funds for buying more bins, and selling the idea to the staff. But the setup wasn’t bad—I just worked on it before and after school. I knew it might be a lot of work to coordinate on my end, but it was important to me. There was an opportunity to make an impact both inside and outside of my classroom. To be honest, our recycling initiative started off slowly. We started by focusing on a single grade—fourth grade—with the hope of gaining momentum each year. Each class had a recycling bin in their room, and they had the task of keeping track of how many bags they brought in each week. We then collected the bags and recorded all the items, offering points or prizes for the leaders each week. The first year was very successful. It didn’t take away from class time, and it really helped us establish a system for collecting all the recyclable materials and tracking and logging them through the Recycle Rally website. Year two of the program, the whole school got involved, and we grew even bigger. 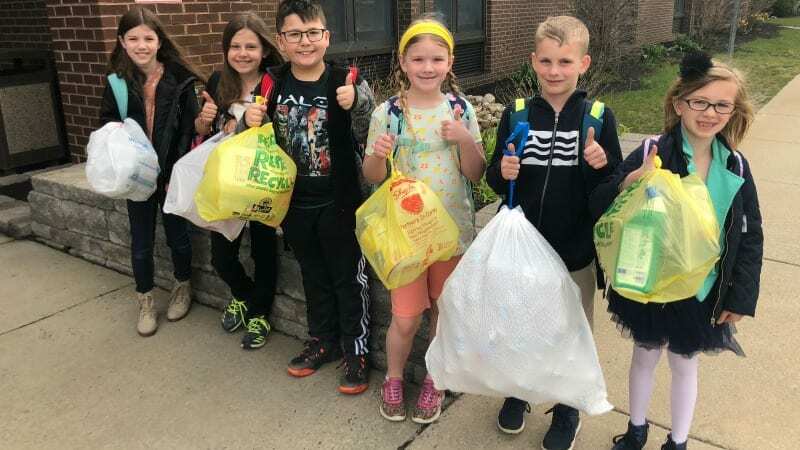 We started using social media to get the word out in the community, and pretty soon, parents and community members were asking us where they could drop off bags of recycling. Our Recycle Rally team did an amazing job of staying up to date with tracking all the items. It wasn’t always the most organized or orderly system. Enthusiasm grew, however, and even the teachers who were skeptical at first couldn’t deny the growing positivity within our school community. Teachers started discussing recycling on a bigger level by bringing it into their lessons and learning about the impact kids were making on the world around them. Our custodians were also amazing during this process, because it wouldn’t have been possible without them. They would help collect and weigh our bags. It really was a school-wide effort. Before long, we were putting bins around the community to hold more recyclables. We also partnered with our high school sports teams and a local sports management doctor to get even more recyclables. At the end of the year, we had a recycling pep rally where we played a trivia game, handed out prizes, and recognized everyone who had been involved. Like most projects that involve so many people, we had some snags along the way. Like when our small bins became overloaded, and we got complaints of “trash” all up and down the hallway. But this was an easy fix with larger bins. We also would sometimes get items that we couldn’t recycle, so we just continued to send home reminders to students about what we could take in the program. All in all, I’ve been incredibly proud. This program ended up being an amazing way to get my special education students involved and seen as leaders at the school. I saw many of them become active participants among their peers across the school. And it was all through the power of recycling. If you’re curious about Recycle Rally and how to get involved at your school, check it out.